has been awarded a two-year tender by the City of Cape Town to provide informal settlements with a dry sanitation system. This system does not use water or electricity, is odourless and is designed with the user’s health, as well as respectability, in mind, says Enviro Options MD Mark la Trobe. Enviro Options has installed the first series of Enviro Loo dry sanitation units for the City of Cape Town. The unit is designed to separate solid and liquid waste as it enters the system. The separate waste is exposed to continuous airflows that dry it. Air is drawn in through the toilet bowl and inlet pipes and out at the top of the vent pipe. The system uses wind and heat to maintain airflows only into the bottom and out the top of the system, making it odourless. 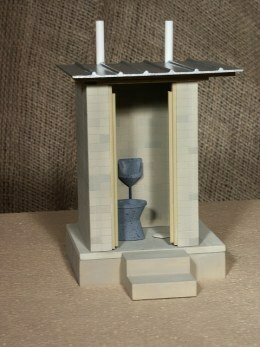 It does not use water so waste volumes are kept to manageable levels. When the waste is removed, it is about 5% of its original volume. their rural schools and clinics respectively, and are the biggest clients of the company. Currently, the dry loos are being installed in schools in Limpopo, he says. 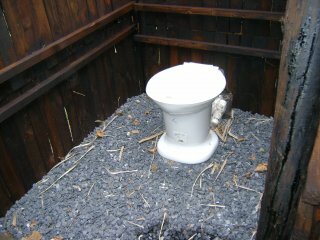 The recession and the loss of orders to Dubai have meant that sales of Enviro Loos have decreased during the past year. However, the company received an increased number of contracts to operate and maintain the units during the same time. The City of Cape Town’s tender included a maintenance contract for the system with Enviro Options. The company usually creates a small business within the community to operate and maintain the system. This creates employment and keeps the system operating and maintained. Users and owners of the system are educated in its use and the people employed by the small company to maintain the systems supplement this through regular interaction with users and owners. “Where we established formal maintenance crews, we find that users are very positive about the product because it operates continually and is not another failure,” La Trobe says. structure. Maintaining the infrastructure creates jobs but also keeps the infrastructure effective. La Trobe agrees and adds that, if maintenance is not done, the public sees the failure of the system as a problem with the product and not as result of lack of maintenance. The Enviro Loo system cannot use chemical detergents and the company provides an organic detergent with which to clean the system. Biodegradable substances can safely be used in the toilet. from the Tech Museum, in the US, for its waterless dehydration/evaporation Enviro Loo. Fifty thousand units are in use throughout the world and the company recently exported a number of systems to France and one to the US in March 2010. Interest in the system has increased since the award was received. La Trobe says that Enviro Options is part of the drive to halve the number of people without access to sanitation by 2015. The company plans to expand its sales into provinces where its products have not been installed before. There are new inquiries from the Middle East region with the easing of the global recession. More than 100 000 households, or half a million people, in Cape Town do not have access to basic sanitation. According to a research report by international initiative Water Dialogues South Africa, about 37 percent of the 128 000 city households living in informal settlements have no access to any sanitation system. While more than two thirds of these residents have been supplied with bucket sanitation options, including the black bucket and Porta-Pottis toilets, the report notes that the servicing of these toilets falls “far short” of required standards. Karen Goldberg, who prepared the report, said the figure of 100 000 households with no sanitation at all was not reported in any of the city’s official reports. The city’s reported sanitation backlog of 47 650 households only refers to households without any form of sanitation. The 80 500 that reportedly have some form of sanitation have to rely on the bucket system, which is not considered a basic form of sanitation. “It is clear from the research that the data available is not being properly interrogated. This is leading to misreporting which has significant implications for planning.” The city has about 3,3 million people or 884 000 households and population growth is estimated to be 1,65 percent annually. This includes an influx of about 48 000 people each year to the province. The city has been under fire recently for its provision of basic services. A furore erupted when the ANC Youth League complained about open toilets in Khayelitsha. The city said there was an agreement with residents that they would build the enclosures if the council provided the toilets. The report criticised the city for “falling short” of its monitoring and regulation responsibilities. Goldberg said the officials in charge of the contracts did not make sure that the service providers adhered to their contracts. “The only regulation that currently appears to be occurring is through reporting mechanisms which is grossly insufficient and open to abuse.” Goldberg said the city had an “ad hoc” approach to sanitation service provision and that planning for informal settlements was “haphazard”. She said this was partly because of the city’s perception that informal settlements were temporary and not worthy of long-term investment or planning. She said the city’s strategy was to provide emergency levels of service to all informal settlements, and to improve these services over time. Goldberg’s report noted that only 2,6 percent or 64 staff of the city’s water and sanitation department worked in informal settlements. Something extraordinary is happening in the backyard shacks of Cape Town. Backyarders — people who live in back yards — are not only organizing themselves but are working together with shack dweller or informal settlement dweller organizations to gather information and propose joint citywide solutions to the city authorities. Here is a sneak-preview of the findings and the social political implications of the self-surveying exercise currently underway in the quintessential Cape Flats neighbourhood of Manenberg. It is commonly acknowledged that those living in informal settlements are socially excluded and are in need of more interventions from Government, but the plight of the Backyard Dwellers in Cape Town is often forgotten entirely. They are neither heard nor seen by the broader Cape Town citizenry or even by the powers that be. Hidden behind vibo-crete walls and formal houses the shocking conditions that they have to endure remain virtually invisible. There are often as many as 3 families squeezed into a single backyard – with each family of about 4 members living in a shack that is no bigger than 3×6m. This is considerably smaller than the average shack in an informal settlement.. It is common to find much larger families in those same dimensions; in one case there were 11 individuals in one house, or Wendy house as they are often called. These families are often female-headed households who find employment in the casual labour sector; specifically the factories that tend to surround these areas. This specific family would take turns sleeping through the night because there is not enough physical space for them all to sleep at the same time. When asked what the biggest problem facing the Backyarders, the response most commonly given was that of landlord-tenant relations. The landlords are the legal tenants of the housing provided by the local councils. It is common for the landlords to charge each family around R400 per month but there are instances of landlords charging as much as R700 per month. On top of this the Backyarders have to pay for electricity which amounts to an additional R160 per month. The landlords themselves are only required to pay R250 to the council for their houses, and a reoccurring problem is that they do not pay their rent. The council is often reluctant to evict for lack of payment, but are well aware of the business of the Backyard Dwellers. The council can only deal with the legal tenant, which therefore means the Backyarders have no voice in the council. In addition to charging extortionate rent, the landlords also control the access between the street and the backyard. This means that should the tenant and the landlord have a disagreement over rent or access to the toilet which is normally in the main house, the landlord can stop people coming to see the tenant or refuse to allow the tenant to leave the property. Children are often forced to climb over fences to get out in order to go to school. As the government builds new houses for the urban poor, the Backyarders are sidelined in favour of those in the informal settlements. This is mostly because the informal settlements are so visible both in terms of where they are and the numbers of dwellers. The Backyarders are hidden behind houses, and are not seen by the general public. Driving down the N2 from Cape Town’s international airport, which is lined by informal settlements, it becomes clear why politician’s efforts are focus on that rather on the far less visible Backyarders. Therefore there is no surprise that this causes feelings of resentment and animosity between the Backyarders and those from the informal settlements. The Backyarders tend to be native to the Western Cape and have been waiting longer than most for new housing. As they see it, they have been waiting patiently on the government’s waiting list, but those who start informal settlements are housed first. So why stay as a Backyarder instead of moving to an informal settlement? One of the main reasons for staying is community. Many of these Backyard communities have been around for more than 20 years and have developed strong communal. Families tend to move within the community rather than away from it, and there is a sense of pride attached to their areas. Moving into the informal settlements would break these well-maintained bonds. Other reasons for staying as a Backyarder include health and security. Although they do not have direct access to toilets, the Backyarders are in a better position in comparison with those people who live in the informal settlements. The housing set-up amongst the Backyarders provides a level of safety that cannot be replicated by the informal settlements. Because there is limited access to the Wendy houses, it means the families are a little safer. However, the crime rate in these areas cannot be understated. The Western Cape areas where Backyarder houses are found such Mitchell’s Plain and Manenberg are rife with serious crime problems. There are significant problems with gang culture and the gangs are commonly thought of as the main perpetrators of the murders, rapes, assault and robbery in the areas. The communities feel that there is a direct and irrefutable link between the lack of houses and the crime rates. Adolescent youth, particularly boys, are drawn into the life of drug dealing and violent crime because of poor schooling and the lack of opportunities available to them. The final push can often come in the form of their living conditions, when the landlords refuse to allow families access to toilets or water. In contrast the council houses that have been taken over by the gangs become an attractive and seemingly viable alternative. The creation of more housing would curb the crime rate because as the developments expand, with it comes increased infrastructure. As it currently stands, the majority of crimes happen in the open fields surrounding the communities, where it is dark and provides cover for the gangs. Members of the community are forced to move across these open plains in order to go to work and reach the main streets to reach public transport. By decreasing the amount of dark open plains with an increase of housing and infrastructure, not only will there be more housing opportunities but there will be less chance for gang culture to operate. Whilst this is not a silver bullet in terms of crime prevention, it does offer a way in which people could make themselves less vulnerable to crime. The problems facing the communities are undeniably complex and cannot be belittled, however they are not insurmountable. In the past the Backyarders have not really had an organization that champions their cause. Whatever voice they might have had was weakened by the utter lack of support from the ward councilors. Any member of the community can run for the position of ward councilor. Of course when they contest the position the candidates always highlight the problems of the community and promise solutions. This assurance that there will be material improvement is short lived, as it is all too common for the ward councilors to fail to deliver any real changes. Once they get absorbed into the system, they rarely come back to their roots. In short, the current ‘bottom-up’ system isn’t working. As soon as they are elected, the ties to the community are severed. With the governmental position comes the governmental paycheck, so ward councilors actually leave the area they are meant to be fighting for. As a result the community has been forced to fill the supportive role, and there are well-established members who are doing more for their community than their ward councilors. In Manenberg, there is a group of women who work tirelessly to try better the situation of the community as a whole. They have now undertaken a community enumeration so they will have detailed information about the communities in which they live. It is also an opportunity for them to mobilize their neighbours. The enumerations allow the communities to own their information. It also means the community becomes aware of what their rights are, what services are available to them, and how to access them. A natural byproduct of the enumerations is increased participation and interest in the community by it’s members, and this significantly increases the possibilities for real delivery to happen. This unified voice is vital when entering into negotiations with the City of Cape Town. The community of Manenberg has a good relationship with the City because of all the contact that they have had over the years – since they have been doing the job of the ward councilors. In August of this year, there was a housing policy review that was undertaken without consulting the Backyarder communities. The change in policy has changed the criteria for those who qualify for houses. If an individual makes under R3500 per month, they then qualify for housing. This has meant that younger adults are being housed before the elders. When the older generation started their jobs, they joined the waiting lists, and as time continued, their wages went up. The policy does not take this into consideration, so the older members, who have families and therefore more dependents on their wages are technically making more money than the younger 20 year olds who tend to be the sole recipient of their wages who are being housed first. This also makes a mockery of the waiting lists. The older families have been on the waiting list for up to 20 plus years are not being housed in light of this shift. All of this highlights the importance of the organization of the community. But one community on its own can never be as effective as networks or agglomerations of communities sharing the same or similar interests. As the community organizations in Manenberg arm themselves with the enumeration they will be looking for outside organizations to provide support. The communities of these areas are coming together to work with the Community Organization Resource Centre (CORC) and the Federation of the Urban Poor (FEDUP), which is an affiliate of Slum/Shack Dwellers International. FEDUP mobilizes urban poor communities through savings. It has over 700 affiliates in informal settlements and urban poor neighbourhoods in cities and towns in all nine provinces. FEDUP has been able to secure tenure for more than 25,000 families and has facilitated the creation of grassroots housing associations that have constructed over 15,000 formal houses. FEDUP seeks to engage state and private institutions in order to find people-centred solutions to challenges of land tenure, infrastructure and housing. This strategy has paid dividends with the National Department of Housing having pledged an annual allocation of 9000 capital subsidies to the Federation. FEDUP also partners the National Ministry in a Joint Working Group that meets regularly to monitor the progress of this agreement. These alliances with different organizations allow the communities to learn from one another and see what is possible through organization and a unified voice. Once the communities have confidence in what they are doing, they are able to address the local government with their concerns and challenge the government to meet them half way.